A great video and article released this week on the development of mobile money in Myanmar. It is very exciting to see companies like Wave Money launching and opening up financial services to the unbanked of the country. Myanmar has massive potential for mobile money. An unbanked market of 94% and smartphone penetration of over 80% present unique opportunities for the myriad of companies starting to provide services. This blog has been posting on the Myanmar market since 2012! Check out the blog posts below if you want to read how this market has developed. 1. Digital and design will change mobile money in Myanmar...and Africa. 2. Mobile Money in Myanmar - A Unique Opportunity. 3. 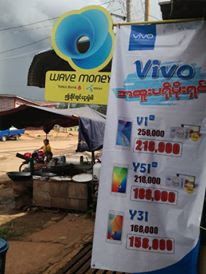 Mobile Money in Myanmar: Significant Opportunity Ahead. Mobile Money Asia is the best source of unfiltered and authentic blogs on the development of mobile money and digital finance in Asia. We are not only observers of the development of this market changing innovation, we are at the core of it. Are you Seeking for a LEGIT HACKER Who Will Get Your Job Done Efficiently With Swift Response???? Congratulations, Your Search Ends Right Here With Us. • Frankly speaking, I always give a 100% guarantee on any job we are been asked to do, because we have always been successful in All our jobs for over 20years and our clients can testify to that .To hack anything needs time though, but we can provide a swift response to your job depending on how fast and urgent you need it. Time also depends on what exactly you want to hack and how serious you are. Enough time with social engineering is required for hacking. So if you want to bind us in a short time, then just don't contact us because We can't hack within 5-10minutes, *sorry*. Basically, time depends on your luck. If its good luck, then it is possible to hack within 5-10minutes but, if it is in the other way round, it would take few minutes or hours. I have seen FAKE HACKERS claiming they can hack in 5min, but there is no REAL HACKER who can say this (AVOID THEM). There are so many Reasons why people need to hire a hacker, It might be to Hack a Websites to deface informations, retrieve informations, edit informations or give you admin access. • Some might need Us to Hack into Court's Database to Clear criminal records. • All these Are what we can get Done Asap With The Help Of Our Root HackTools, Special HackTools and Our Technical Hacking Strategies Which Surpasses All Other Hackers.